B&G Seed Company was founded in 1981. Beginning with a simple Clipper seed cleaner, we farmed and cleaned such commodities as wheat, rye, oats, fescue, and millet for ourselves and local growers. 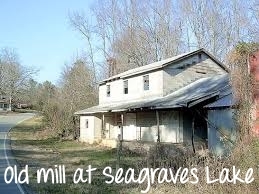 In 1985 we purchased the rights to the local Seagraves' corn meal and Ol' Blue dog food operations, and continued manufacturing at the old mill for several years before moving it to Beck Road with the seed cleaning facility. Today, the milling equipment and seed cleaner still operate next to modern extruders, blenders, and roasters. A staple within the north Georgia community, Ol' Blue dog food is now distributed throughout the southeast by over two hundred retailers. Future plans for B&G include the installation of a new extruder to increase quality and output of Ol' Blue, and a pellet mill to achieve greater independence from nationally operated commercial feed suppliers. Creating the freshest, most economical, and healthiest foods for your pets and livestock is B&G's priority, and we look forward to serving your agricultural needs. Nestled in the rolling hills of northeast Georgia and halfway up the Nowhere road that runs from Athens to Ila is the B&G Seed and Feed Company mill. Like a beacon of a bygone era, B&G is one of the few remaining full service feed mills in operation. From stone ground corn meal to pea shelling to pecan cracking to custom feed mixing to a wide variety of farm services, we do it all here on site! We pride ourselves on superior quality products and customer service. Only here can you find livestock feeds made entirely from locally grown crops, and free from byproducts of commercial industry. Only here will you always be personally greeted with a smile; your order fulfilled and loaded in a timely manner. Our friendly, knowledgeable, and courteous staff is always able to assist you in any of your agricultural endeavors. As farmers, ranchers, and pet owners oursevles, we strive to personally accomodate every request and question. We sure hope you take the scenic drive through what's left of Georgia's rural farm country to visit us soon!